Deliciously sweet. Consistent quality, proven wine. Most awarded wine brand US competitions. 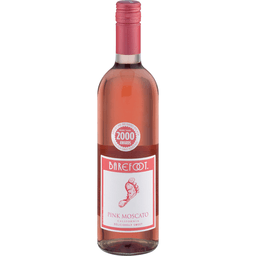 Footnotes: Barefoot Pink Moscato is a juicy and refreshing wine with ripe nectarine aromas and flavors. 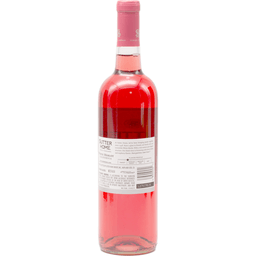 Layers of raspberry and pomegranate complement the lingering, sweet citrus finish. Enjoy with pot stickers, fruit kabobs and strawberry shortcake. Superb! barefootwine.com. Get Barefoot and have a great time! Alc. 9% by vol. Table wine with natural flavors. The world's most popular wine. Since 1906. Premium wine. Award winning wines. New & improved. Drip-free Smart Tap. The story behind Franzia. A new beginning - Teresa Franzia, my grandmother, planted her first vineyard along the road to Yosemite in 1906. Her family survived Prohibition by selling these grapes to home winemakers back East. When Prohibition ended, my father and his six brothers and sisters rebuilt the winery brick by brick, barrel by barrel - everyone pitched in. After the war, my uncle's new advertising slogan, Make Friends with Franzia, introduced a new generation to wine. Our revolutionary fresh to the last glass Winetap system made its debut in 1978. 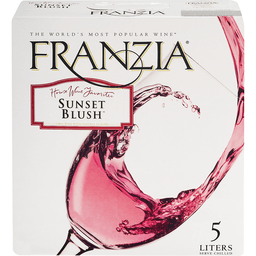 Because it was more convenient and offered better value than bottles, Franzia started to catch on. It went on to become the world's most popular wine and the first (and only) Winetap to freshness date every package. As we enter our second century of winemaking, we strive to freshness and value. Not just by winning competitions around the world, but more importantly, by helping to bring the enjoyment of good wine to your home each night. The award winning wines of Franzia stay fresh to the last glass, even after the package has been opened, because Franzia's patented Smart Tap spout and unique inner pouch prevents the oxidation that occurs in half empty wine-in-bottles. Freshness assurance. Alc 9% by volume. Product of USA. Naturally gluten free. Please drink responsibly. Red Flesh Apples: You haven't seen these apples at the grocers. 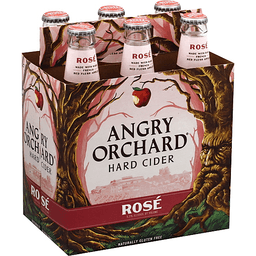 The red flesh apples in Angry Orchard Rose are from France. Each apple is crisp, juicy and red all the way through to the core, adding an irresistible rosy blush to this refreshing hard cider. 5.5% alcohol by volume. Since 1890. Family owned in the Napa Valley. Family owned. Family owned in the Napa Valley with a tradition of producing quality wines from grapes grown in California's premier vineyards. Enjoy the wines of Sutter Home and discover why we have become an American favorite. www.sutterhome.com. Drink responsibly. Drive responsibly. Alc. 11.5% by vol. 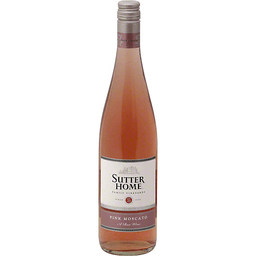 Vinted & bottled by Sutter Home Winery, Inc., Napa, California 94589.